Non-stop fun for the whole family! Family fun happens just about everywhere; luckily, that's exactly where COOLPIX S32 can go! It can dive underwater down to 33 feet deep, handle drops from up to 5 feet high, and you can even take it in the snow when temperatures are as cold as 14°F—places many wouldn't want to bring a smartphone. The COOLPIX S32 will keep capturing outstanding high-resolution photos and Full HD 1080p videos with stereo sound. Oversized buttons and intuitive menus make operation a breeze, and the camera's low-light image sensor helps capture sharp photos underwater, indoors at parties, outside when the sun is setting—all without a flash! The COOLPIX S32 can go diving up to 33 feet deep, withstand drops of up to 5 feet and can play in the snow at temperatures as cold as 14° F, so even the roughest conditions won't stop you from recording precious memories. Safe to take to the beach, pool, playground and any place fit for family fun—you can always get a great shot of the action. Taking great photos and videos with the COOLPIX S32 is so easy, everyone can have a turn using the camera. Its oversized buttons are friendly to hands of all sizes, and you won’t have to adjust any settings to get great shots—just point and shoot and let the camera do the rest. This is a camera designed with the whole family in mind. If you want a compact camera that shoots stunning Full HD videos, the COOLPIX S32 delivers. Full HD 1080p means exceptional video quality. Record the action, then connect to an HDTV* and watch your videos come alive. A built-in mic records high-quality audio in stereo. Your videos will look and sound phenomenal. Every COOLPIX is designed around a genuine NIKKOR glass lens, the legendary optics that have made Nikon famous. The COOLPIX S32's 3x Zoom NIKKOR lens is great for everything from wide-angle group shots to close-up portraits. Plus, Electronic Vibration Reduction helps keep every video steadier, even if your hands are not. Imagine being able to shoot without a flash at weddings, concerts, parties—anywhere your flash normally fires. You won't have to interrupt a moment to capture it, and your photos will look more natural and true to your memory. The COOLPIX S32 performs so well in low light situations that, in most cases, using the flash is optional. Of course, when the lighting is extremely poor and you need a flash, it'll be there. Easily apply fun and creative Image Effects like fisheye, toy camera, cartoon and more right from the camera—no need for additional photo or video-editing software. Create beautiful photos of the people you care about. Smart Portrait System activates several features ideal for portraits, like Face Priority AF, Skin Softening, Smile Timer and more. Easily match your situation to one of the Scenes and Effects modes like underwater, night, close-ups and more. Maximum high ISO available on the camera is 1600 ISO. 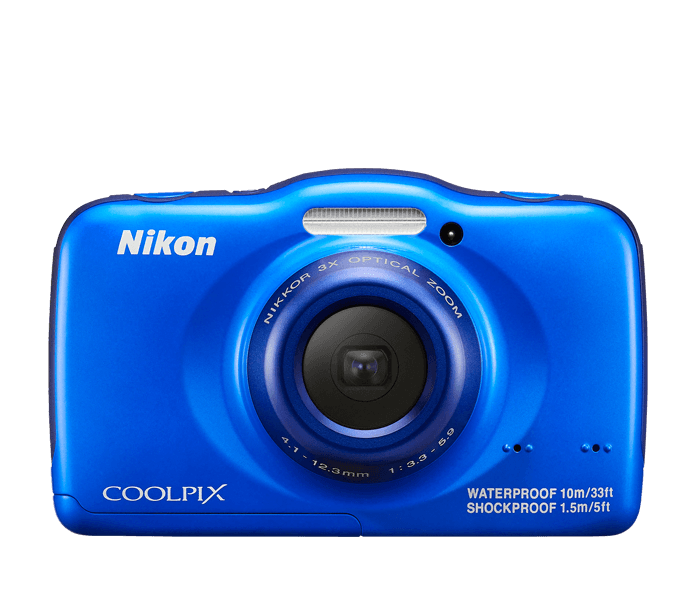 Rugged Reliability describes Nikon COOLPIX digital cameras that are waterproof and shockproof. Check your manual to see exactly what waterproof or shockproof designations your camera has.